Leaving behind your old house and moving to a new city can be very stressful. Luckily, there are ways to get well prepared and avoid, or at least be ready to face all the bumps you can stumble upon down the road. First of all, you’ll need to make a final decision: Are you leaving for good? If the answer is undoubted YES, then go ahead and make a detailed plan which will come in handy during turbulent moving days. 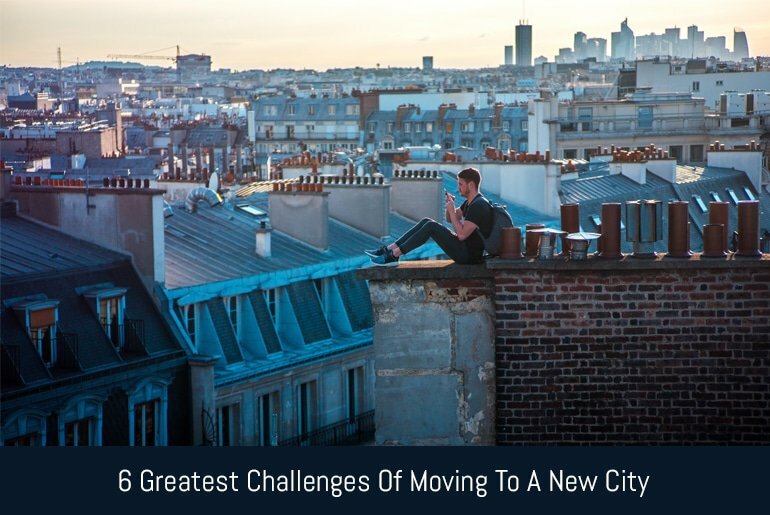 Below are some of the most usual challenges people face after deciding to move to a new city. The first list you should assemble is the one with all possible expenses coming your way. Get informed about the real estate costs in the new city and talk to your agent about the best deals they can offer. In case you just want to rent an apartment, check as many listings as you can before moving. If possible, it’s recommended to avoid the peak of tourist and vacation season, since the demand during those periods is high and it will be harder to find and affordable place. On the other hand, if you’re buying a house, make sure to go there for a few days first before moving with all your stuff. Once you’ve found your new home in another city, you can start packing. Make sure to pack just the stuff you really need for your new life. You don’t want to get your new house cluttered right away. If there are plenty of items you don’t use regularly, you may try to get rid of them by setting up a big yard sale. The other way is to find a charity organization near you and donate everything unnecessary. That way, you’ll be able to travel light and you’ll make someone very happy. In order to avoid heavy lifting and possible furniture damage, make sure to entrust this task to professionals like Sydney removalists or others in your local area and they’ll take care of the job in no time. Mark the boxes with different colors, so you’ll know where to look if you need a specific item. Once you’ve arrived, you should work on unpacking and setting up your home interior. In case you have to start working right away, get prepared for a lot of stress during the first week. There are so many issues you need to address. You’ll need to meet new people, to figure out the best way of transportation, to find a good place to eat and to leave a good first impression. Don’t be scared. You can go through all of this if you have a good plan and you’re highly motivated. Once everything is over, you’ll become aware of the great job you’ve done on such short notice. At first, you may feel very excited and vigorous, and those feelings will help you go through the first period in a new city. After the initial excitement, it is possible to experience fatigue and confuse it with a feeling of nostalgia or even depression. You shouldn’t run from those feelings, but try to embrace them, and as time goes by, you’ll overcome them and adapt fully. Give your best to keep your morale high and keep up with the plan you made before moving. Sometimes you’ll feel like these hard times will last forever, but they won’t. Once you’re done with the initial adaptation to a new place, you’ll feel like a completely different person. You’ll most definitely become a better, stronger version of yourself in no time. The new city has so much to offer. First of all, you’ll stumble upon plenty of new restaurants, museums, and clubs. Of course, you may get pretty lonely if you pay them a visit by yourself. Because of that, it is good to make some new friends. At the beginning, you will try to get close with a lot of strangers, and just a few of them will become your friends. During that period of experimentation, you may face a portion of social exhaustion. Keep in mind that those new people are not the only ones you need to meet those days. Before you move, you’ll need to meet with all your old friends and members of the family as well. Be strong and answer all their questions related to moving, even if you still don’t have the right answers. Keep calm, and stick to your plan as this event offers a great opportunity to make some significant changes in your life. Let’s say the first month of your new life is over. You’ve unpacked and organized all your stuff, and your new home looks just beautiful. You’ve also met some interesting people you can call for a drink or catch a movie and meal. You are happy at your working place, you have good colleagues that accepted you and you finally feel relaxed and satisfied. Don’t get too relaxed since the period behind you gave you a lot of new energy and you learned a lot about yourself. Make sure to save that feeling of productivity and ride that wave as long as you can. You should really try to do this because the last major challenge in front of you can be the worst one. You may fall into a routine, and you won’t even notice before you become stressed out and start questioning your moving decision. As you can see, while there are a lot of challenges considering moving to another city, there are maybe more good answers and practices to overcome them. Remind yourself to stay motivated and productive every morning you stand in front of the mirror. If you do that, you’ll be able to tackle any issue that may emerge down the road. Keep in mind that you made the best decision by moving to a new home and stick to that feeling.